The G.W. 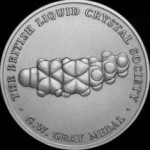 Gray Medal of the British Liquid Crystal Society is awarded from time to time for outstanding contributions to research in the field of liquid crystal science and technology. It was first awarded in 1996, following the award of the Kyoto prize for Advanced Technology to George Gray. The award is open to nominees of all age groups, with the single criterion that nominations must be for seminal research contributions of international quality. The Award is open equally to those from academic and industrial backgrounds. The recipient will deliver a lecture at the Annual Conference of the Society and a description of the recipient’s work, written by the nominator, will appear in the Society’s Newsletter. The award takes the form of a silver medal. Nominees require both a nominator and a seconder; the nominator should normally be a member of the British Liquid Crystal Society. The nomination will take the form of no more than one side of A4.